Today is Setsubun (節分 Bean-Throwing Festival or Bean-Throwing Ceremony) the day before the beginning of spring in Japan. The name literally means “seasonal division,” but usually the term refers to the spring Setsubun, properly called Risshun (立春) celebrated yearly on February 3 as part of the Spring Festival (春祭 haru matsuri). In its association with the Lunar New Year, spring Setsubun can be and was previously thought of as a sort of New Year’s Eve, and so was accompanied by a special ritual to cleanse away all the evil of the former year and drive away disease-bringing evil spirits for the year to come. This special ritual is called mamemaki (豆撒き) (literally “bean throwing”). Setsubun has its origins in tsuina (追儺), a Chinese custom introduced to Japan in the eighth century. The custom of mamemaki first appeared in the Muromachi period (c. 1337 to 1573). It is usually performed by the toshiotoko (年男) of the household (the male who was born in the corresponding animal year of the Chinese zodiac), or else the male head of the household. Roasted soybeans (called “fortune beans” 福豆) are thrown either out the door or at a member of the family wearing an Oni (demon or ogre) mask, while the people say “Demons out! Luck in!” (鬼は外! 福は内! Oni wa soto! Fuku wa uchi!) and then slam the door. This is still common practice in households but many people will attend a shrine’s or temple’s spring festival where this is done. The beans are thought to symbolically purify the home by driving away the evil spirits that bring misfortune and bad health with them. Then, as part of bringing luck in, it is customary to eat roasted soybeans, one for each year of one’s life, and in some areas, one for each year of one’s life plus one more for bringing good luck for the year to come. 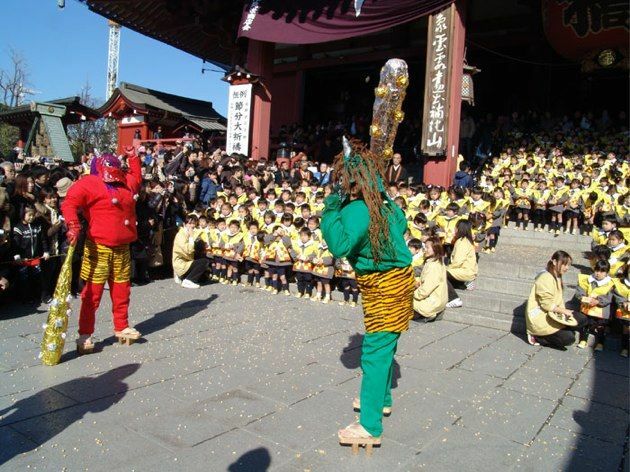 At Buddhist temples and Shinto shrines all over the country, there are celebrations for Setsubun. Priests and invited guests will throw roasted soy beans (some wrapped in gold or silver foil), small envelopes with money, sweets, candies and other prizes. In some bigger shrines, even celebrities and sumo wrestlers will be invited; these events are televised nationally. 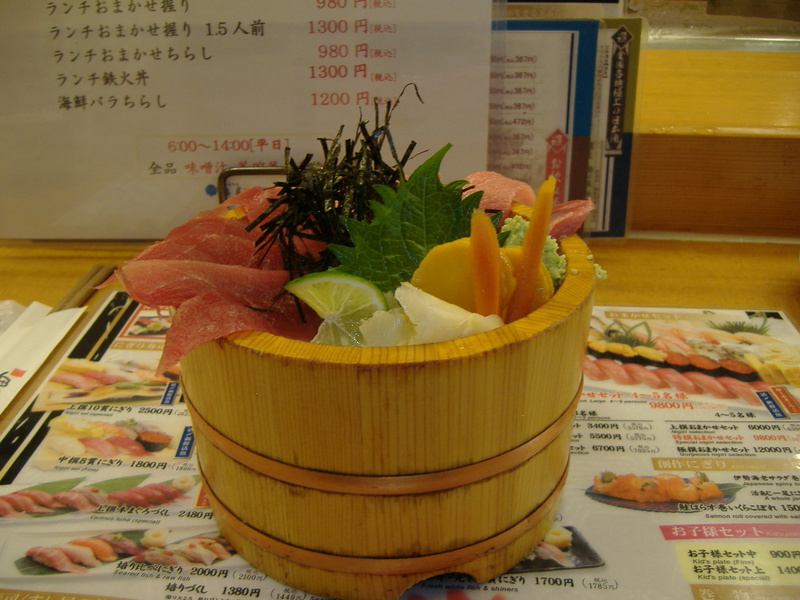 It is customary in Kansai area to eat uncut makizushi called eho-maki (恵方巻) (lit. “lucky direction roll”) in silence on Setsubun while facing the year’s lucky compass direction, determined by the zodiac symbol of that year. 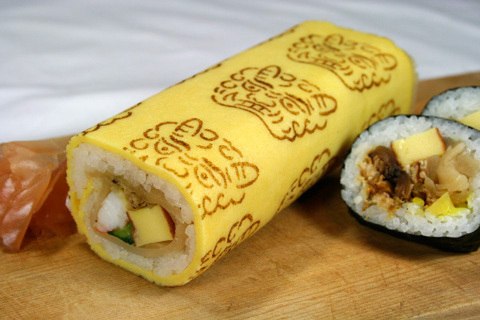 This custom started in Osaka, but in recent years eho-maki can be purchased at stores in the Kanto area and it is getting more universal as a part of Setsubun tradition. Horoscope charts are published and occasionally packaged with uncut makizushi during February. 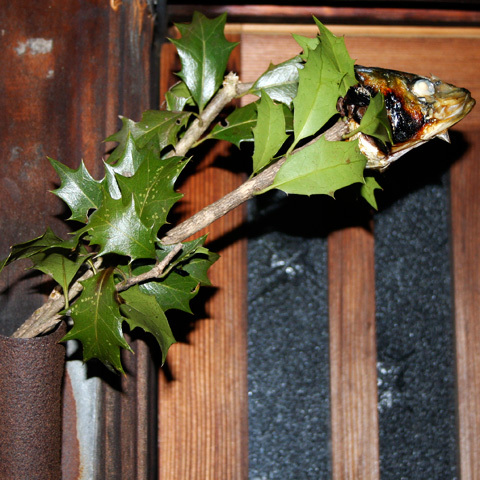 Some families put up small decorations of sardine heads and holly leaves (柊鰯 hiragi iwashi) on their house entrances so that bad spirits will not enter. Ginger sake is customarily drunk at Setsubun. 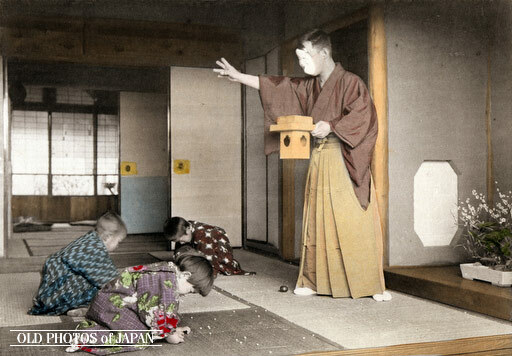 Historically, the new year was felt to be a time when the spirit world came close to the physical world, thus the need to perform mamemaki to drive away any wandering spirits that might get too close to one’s home. Other customs during this time included religious dance, fasting, and bringing tools inside the house that might normally be left outside, to prevent the spirits from harming them. Because Setsubun was also considered to be apart from normal time, people might also practice role reversal. Such customs included young girls doing their hair in the styles of older women and vice versa, wearing disguises, and cross-dressing. This custom is still practiced among geisha and their clients when entertaining on Setsubun. Traveling entertainers (旅芸人), who were normally shunned during the year because they were considered vagrants, were welcomed on Setsubun to perform morality plays. Their vagrancy worked to their advantage in these cases because they could take the spirits with them when they departed. 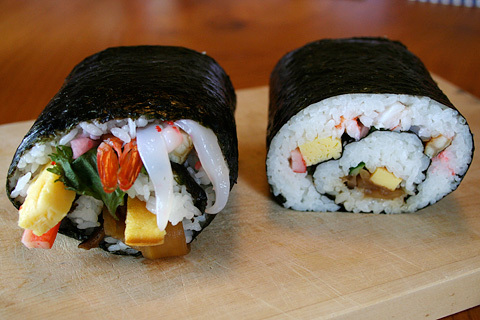 While the practice of eating makizushi on Setsubun is historically only associated with the Kansai area of Japan, the practice has become popular nationwide due largely to marketing efforts by grocery and convenience stores. In the Tohoku area of Japan, the head of the household (traditionally the father) would take roasted beans in his hand, pray at the family shrine, and then toss the sanctified beans out the door. Nowadays peanuts (either raw or coated in a sweet, crunchy batter) are sometimes used in place of soybeans. I have spent decades eating and cooking Japanese food. In 1972 I went to the only Japanese restaurant in London with my girlfriend (of sorts) to celebrate my 21st birthday, as the culmination of a fabulous day. It was completely brand new to me in those days when few people in the West had ever tried Japanese cuisine. We were the only Westerners in the place, and the servers, dressed as geishas, barely spoke English. All the other diners were Japanese men in suits. I left spell bound, determined to learn more; I was hooked. I was glad that by the late 70’s Japanese restaurants were blossoming in New York and I went every time I could, even though the menus tended to be limited to the basics: sushi, sashimi, teriyaki and such (and the majority still are). Nowadays I can make certain dishes reasonably well, including sushi and sashimi, but I will never remotely be a threat to classically trained Japanese chefs. Tramping all over Japan was an eye opener – such an amazing experience. So many great meals even when eating in cheap noodle joints in hidden places. Here’s a pic of me with my son and a friend in a sushi/sashimi joint in the famed Tsukiji fish market in Tokyo plus my lunch dish. Yum. I could walk you through the steps to make eho-make; it’s really not that difficult (although getting the rice right takes a bit of practice, and you must use Japanese sushi rice). Instead I give you this video because it is much easier to see it done than to describe it. Two things to note. First, eho-make must be made with seven ingredients – a lucky number. Second, it is eaten whole, not cut up. This is not easy because the nori (black seaweed) wrapping is quite tough to bite. The bamboo rolling mat is more or less essential, but before I bought mine I used a place mat that was similarly articulated. You also need practice to get the roll nice and round. But even a lumpy one tastes good. Trust me on that.